With both my parents now gone there is no-one to remember with me the self that I was as a child. Of course I still have my siblings and a few childhood friends, but they don’t have the memories about me that my parents did. After 23 years of living with English language, it was refreshing to remember and write in Danish. A bit rusty perhaps (but I am not a best-selling author like Christian Mørk); memories flowed easily and my brain was filled with words, images, smells, feelings and sensations that were conjured up and remembered in Danish. I have lived all my working life in Australia. When my mother first visited us I tried to explain to her my work in Danish. I found it really difficult – I could not find the Danish words for the particulars of my day-to-day working life, which itself was word and language based, working with policy, procedure and freedom of information decision-making, carefully reading complex documents, interpreting the statute, analysing precedents and choosing the right words to describe my decision, so it could withstand scrutiny. I was constantly using English words to explain my role to mum, who must have felt she was losing me in more ways than one. My siblings can remember with me, but my parents knew me differently. 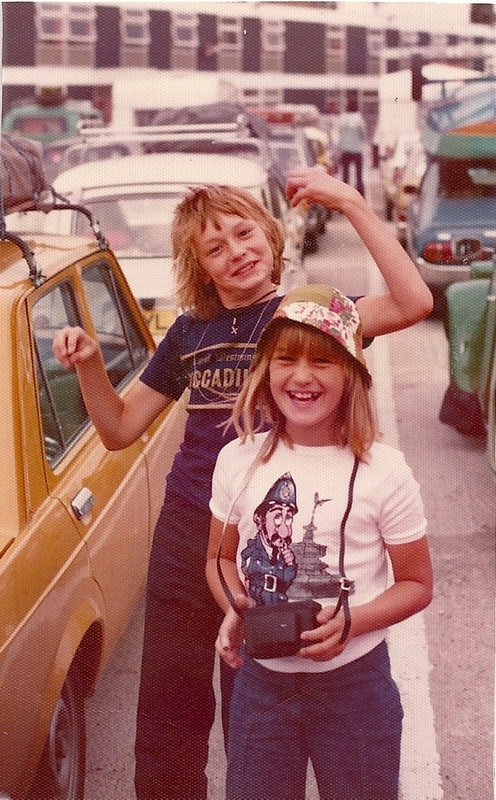 My brother and I fooling around in London 1976. Photo: private. A couple of years ago I found myself working up my cv in Danish – my public service profession was under attack by an incoming government and the villification of the public service was rife in the media. A public outrage was whipped up against an old stereotype of useless, lazy public servants – a stereotype I found difficult to reconcile with the commitment and hard work of public servants all around me. I lost my job in a restructure and I thought perhaps I needed to go back to Denmark to continue to support my family. Writing about my work experience in Danish was a difficult task and I found it hard to succinctly explain my responsibilties and achievements in a different language. I never sent the cv to any prospective, Danish employers. In the end, I won back my job and I stayed in the Australian-English life world. Language and memory go together. The story of Nabokov’s three autobiographies is well known: first he wrote and published Conclusive Evidence in English. Then he began translating it to Russian, but found thinking about his life in Russian brought out much more memory worthy of documentation, making the English version seem woefully inadequate. Once he had finished his Russian autobiography (Drugie berega or Other Shores) he then translated it to English; yet he found it difficult to fit his Russian experiences into the ‘straightjacket of English’. So he ended up with three very different documented versions of the same life, the last being Speak, Memory. We experience the world differently in different languages. My Australian-English experiences are very different to my Danish experiences – not just because of different place and culture. How I remember my experiences depend on the language I use to remember. When I reconnected and started corresponding with my dear departed uncle, who was in the business of story telling, he called my Danish language refreshingly crisp and uncorrupted by adulthood and work’s habits. He encouraged me to write more and to write in Danish. When I joined the Queensland Writers Centre, I was advised to write in English – if I wanted to be a professional writer – because the market is much larger than the Danish market. And if I wanted help and support with my writing here in Queensland, this would only be possible if I wrote in English. Fair enough, but knowing what I now know about memory and language, perhaps this is not quite right for me. I am currently writing in English – my writing would no doubt be different if I write in Danish. It would also be challenging. I love the Danish language and want to reclaim it for my future self. If I get to write my book when I am away, it may well be in Danish. That would be my writer’s pied a terre. This entry was posted in Writing and tagged Australian, childhood memories, Danish, Danish language, English, English language, language, life world, memoir, Memory, Russian, writing on October 3, 2014 by lonebonekaffekone. Thank you Kirsten. I am glad my post resonated with you. I’ll have to try reading in a different language to the one I am writing in – I imagine flipping between languages help the brain make new connections that enable new ways of putting meaning into words as well. Hi Lone, I’ve been living in the south of Germany since July. Have loved every minute of my time here. I’m returning home shortly so will look forward to seeing you and discussing cross-cultural living! Reblogged this on Translator Power. Thank you for this touching blog entry! I cannot agree with you more… Each new language indeed opens up a new fascinating perspective on our life, and at the same time there is something that is left behind being lost in translation.. Thank you for your comment. Perhaps a certain duality or multiplicity within the individual is the inevitable and fascinating result? I couldn’t put it better myself 🙂 Agree for 100%. Would London by any other name be as … Londonish?